Black cohosh is a flowering plant native to North America. Ancient cultures made use of black cohosh as a remedy for snake bites. Many Native American tribes refer to it as rattlesnake and consider it a cure-all for women’s health. It goes by several other names, including snakeroot, bugwort, rattleroot, rattletop, and Sheng Ma in China. Pollutants, environmental toxins, UV rays, processed food, even some medicines can lead to oxidative stress. This results in free radical damage in your body. When free radicals enter your cells and damage your DNA, it leads to disease. As the name suggests, antioxidants fight oxidative damage–and black cohosh is packed with potent antioxidants. This means it could help prevent inflammation and diseases like cancer, and even combat signs of aging (x). The antioxidants in black cohosh benefit your heart health by lowering cholesterol levels and preventing cell damage (x). 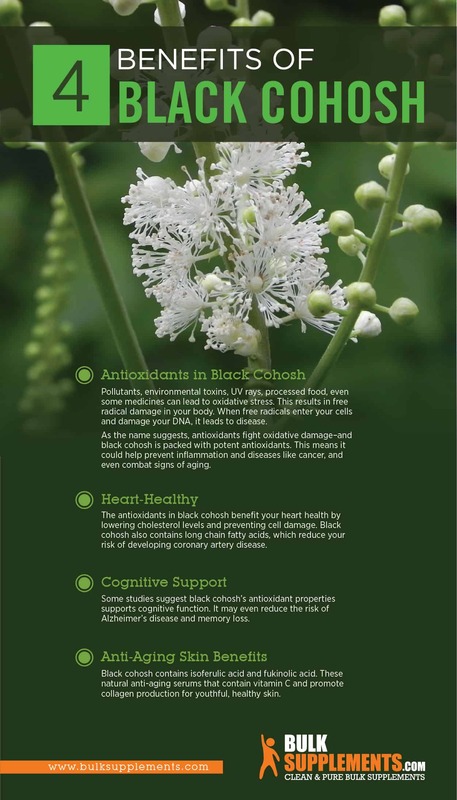 Black cohosh also contains long chain fatty acids, which reduce your risk of developing coronary artery disease (x). Some studies suggest black cohosh’s antioxidant properties support cognitive function. It may even reduce the risk of Alzheimer’s disease and memory loss (x). Black cohosh contains isoferulic acid and fukinolic acid. These natural anti-aging serums contain vitamin C and promote collagen production for youthful, healthy skin (x) (x). Estrogen is a hormone responsible for many aspects of cell growth in women. Too much estrogen can lead to tumors or cancer. In contrast, low estrogen may lead to infertility, depression and irregular menstrual cycles. Studies suggest that black cohosh benefits hormonal balance in women by mimicking estrogen. In addition, it can help relieve symptoms of polycystic ovary syndrome (PCOS), including hot flashes, cramping, and irregular periods (x). Because black cohosh mimics hormones, those with breast, uterine, cervical, or ovarian cancer should speak to their doctors before taking it. Inflammation is at the root of many disease and ailments. It’s not inherently bad–in fact, it’s actually the body’s immune response to a wound or illness. But when left unchecked, it can lead to diseases like cancer and rheumatoid arthritis (x). Preliminary studies suggest that black cohosh acts as an anti-inflammatory, stopping cells that trigger your body’s inflammatory response (x).And because the same cellular pathways that trigger inflammation also set off allergic reactions, black cohosh could help relieve chronic allergies and allergy symptoms (x). Other side effects may include stomach upset and weight gain. If you are pregnant or have a hormone-sensitive condition, speak to a doctor or nutritionist before taking black cohosh. Black cohosh may increase the risk of liver damage. Talk to your doctor before taking black cohosh if you have a history of liver problems, or if you take medication that is changed by the liver. Black cohosh may decrease the effectiveness of certain cancer drugs. If you have cancer, talk to your doctor before taking black cohosh. If you take medication to lower your cholesterol, talk to your doctor before taking black cohosh. It could increase your risk of liver damage (x). Generally, black cohosh supplements contain the herb’s roots and stems. Supplements are available as powders, liquids, capsules, tablets, or tinctures. Black cohosh extract powder is one of the most effective forms of the supplement, as it contains a high concentration of beneficial compounds and antioxidants. As a dietary supplement, take 800 mg (about 1/4 tsp) twice daily, or as directed by your physician. 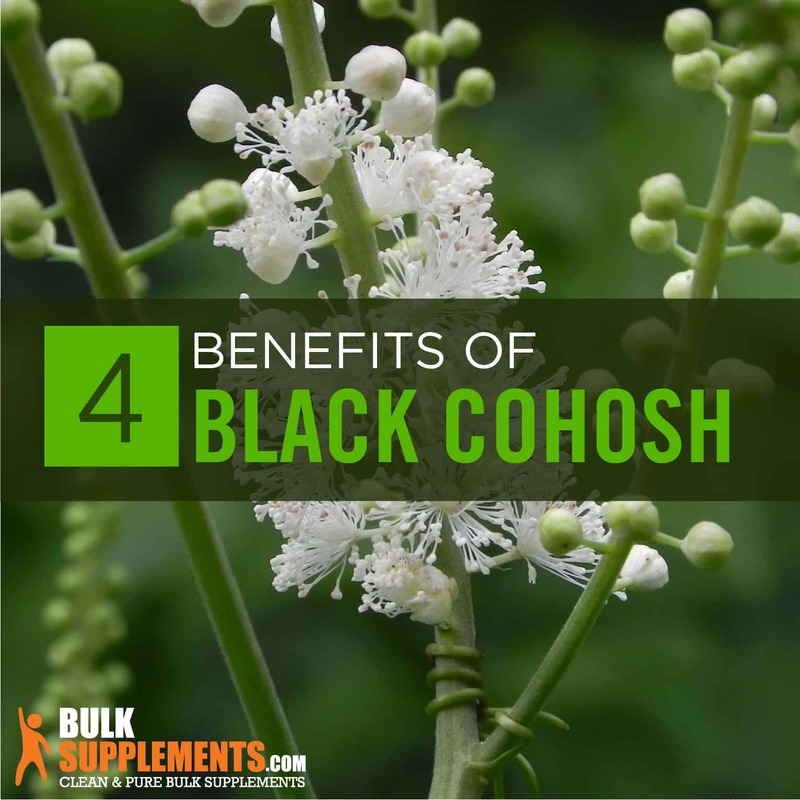 Black cohosh is a powerful plant with potent antioxidant benefits. It helps relieve PMS and menopause symptoms, protects your body from free radical damage, keeps your skin youthful, and may even prevent cognitive decline. And with a wealth of scientific research supporting its benefits, it’s an herbal remedy with a proven history of boosting overall health.